Not too bad for a couple of hours of work I would think. Nice. How easy is it to convert other tiles, say for CC or Dunjinni, to SVG forms? Not sure, it may be very easy using the automatic trace included in Inkscape (powered by potrace) but this will produce pretty bloated SVGs. I am working on some tile based stuff, so we can both scales of maps. morbus iff, the SVGs produced by Inkscape automatic trace can be made lighter using Path->Simplify (combined with tweaking parameters for the tracing operation). 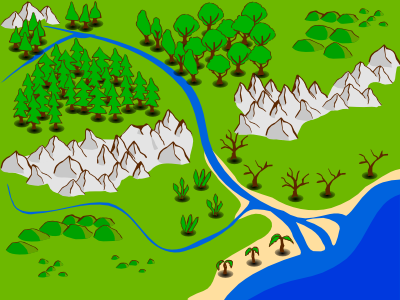 As for your specific ASCII map, I don't think it will be easy to trace it, but you can import the image as bitmap and draw on top of it using either Freeform Line or Caligraphic Line - this is how i created in this sample map the terrain in background and the rivers. loog at this as a rough sketch: http://nicubunu.ro/pictures/rpg/ghyll.png (of course it will need a lot of polishing, but i hope you get the idea). Yup, got the idea. At this point, I'm not sure how I want to proceed. 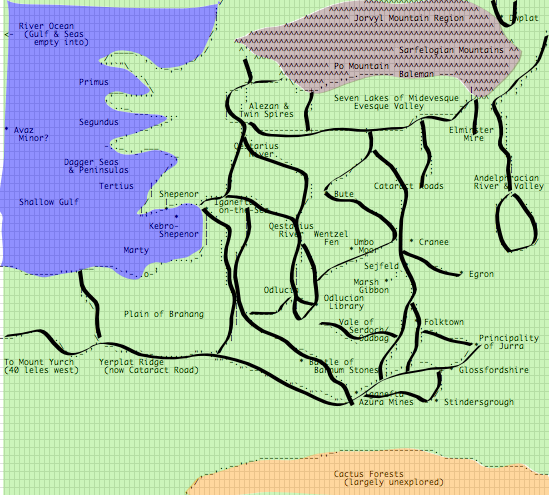 I've done the soulsearching for a decent map program before, and eventually settled on Dunjinni (it was the only one that was a) relatively recent, b) had a community, c) had a bunch of community tiles [ie. back to me sucking at drawing], and d) ran on Mac, Linux, and Windows. It's largish downside was it wasn't open sourced, and cost money. Inkscape satisfies a), b), and d) (where c) is defined as "game map tiles"), but I'm not sure if I want to a) always draw on top of the ASCII map, making that the authoritative version or b) start fresh in Inkscape, where each tiny ASCII square is a larger measurement in Inkscape (which can then be scaled down to a smaller "bird's eye view"). I like the idea of using stamps like trees and mountains (per your example), but also need it on a smaller scale (as Ghyll is growing rapidly). Using SVG and its scaling makes me happy (no loss of quality) and that's something that Dunjinni couldn't provide (but, CC could). Sigh, decisions decisions. Part of my problem is the time required to learn a new program and to get it "right". I think that's slowing down a lot of my decision making process (and perhaps, stalling it interminably, since I can't know if a program is "wrong" until I start the effort of doing some "real" with it). I was glad to see all the buildings, you made and will probably try to insert a few in my adaptation.